Review: Harold Shand is a successful London gangster whose world falls apart over the course of just one weekend. He controls the London docks and is planning a big estate deal. The money is financed from the American mob. He thinks he has everything until three bombs go off. One inside his Rolls Royce, one in a pub he owns and one inside his casino. He can’t understand that someone would want him dead, especially over the Easter weekend. This is the film that got Bob Hoskins his big break. The part of Harold Shand was actually written with Bob Hoskins in mind. I don’t think that Helen Mirren added anything to the film. Whether she didn’t really have much to work with, or she was not well directed, I don’t know as she is a brilliant actress. This is Pierce Brosnan’s first feature film. He didn’t have much to do but by watching him he portrayed a lot. 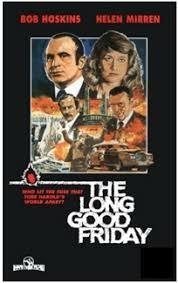 It is very interesting to watch the film now and look back on what it was like in London in the late 1970’s. We forget what it was like back then. All of Harold’s plans for the London docks and what he prophetically predicted became the creation of Canary Wharf. At the time I bet not many people or the majority believed him but he was right. It is hard to believe that now it is one of the most vibrant places to live and work in the U.K. Apparently while Bob Hoskins was doing his performance he received a fan letter from notorious London gangster Ronald Kray. In 1983 a sequel to this film was announced but the project came to nothing. It was going to start with the last scene of this film and carry on from there. Barrie Keeffe, wrote the script but nearly went straight onto TV. What a shame this would have been considering what a classic film it now is. In 2013 the late Barry Norman produced a list in The Radio Times of the 50 British Films of all time and this was featured amongst the list of films.